You may collect your copy of ‘Insight’ directly from the Sankara Nethralaya (Main Campus), located at College Road, @ Rs.1000 per copy by contacting Shri M.Senthilnathan. By mailing a cheque in favour of ‘Medical Research Foundation’ for the total amount, inclusive of the cost of the book and shipping charges as applicable to your mailing address. 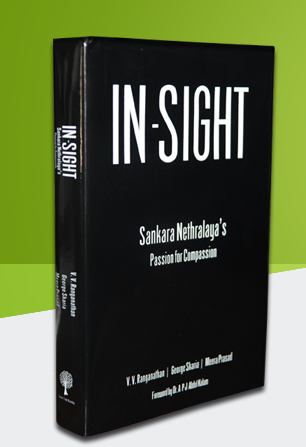 Get your copy of ‘In-Sight – Sankara Nethralaya’s Passion for Compassion’. This long awaited inside story of the birth and growth of a world-class humanitarian institution could be the treasure trove in your home library, a book to read and preserve for posterity. The poignant narration of the saga of Sankara Nethralaya or the ‘Temple of the Eye’ by Shri V.V Ranganathan, entrepreneur and biographer par excellence, is enriched with an interesting foreword by Dr APJ Abdul Kalam, Former President of India and absorbing chapters by an array of luminaries like Shri Gopalkrishna Gandhi, Shri N.Murali,Shri Rahul Bajaj, Shri A.M. Naik, Ms Mallika Srinivasan, Shri Rakesh Bharti Mittal, Dr Prathap C.Reddy, Shri Amitabh Singh,Shri Deepak S.Parekh and Dr Vasanthi Badrinath and is now available at Sankara Nethralaya’s Main Campus at College Road. In-Sight is an amazing story of the divine command of a sage and Seer, which became the calling and passion of one man and the light of vision to millions. Shri VV.Ranganathan in his own inimitable style captures the spirit and missionary zeal of Dr.SS.Badrinath and his dedicated associates and their ceaseless crusade against blindness. The book takes readers through an interesting journey spanning the humble beginning and growth of a world class eye care centre started on a modest rented premise to its present stature as a sprawling State of the Art hospital with several centers within and outside Chennai. Last but not the least, like most Sankara Nethralaya endeavors the sale proceeds of this book……… yes you guessed right! The sale proceeds go towards meeting the cost of providing free treatment to the poor and needy, which is another great reason for you to buy and preserve this book. 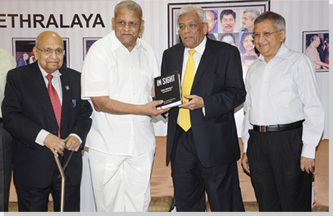 The first copy of Insight was released by Shri Deepak S.Parekh, Chairman, HDFC at a grand launch function attended by leading industrialists and celebrities, held at Mumbai on the 20th of March, 2012.